It has been difficult to build-up enthusiasm this summer because insect abundance is way down here in Colorado Springs, but when I get to witness an event like I did yesterday, it makes me glad I went out and made an effort. 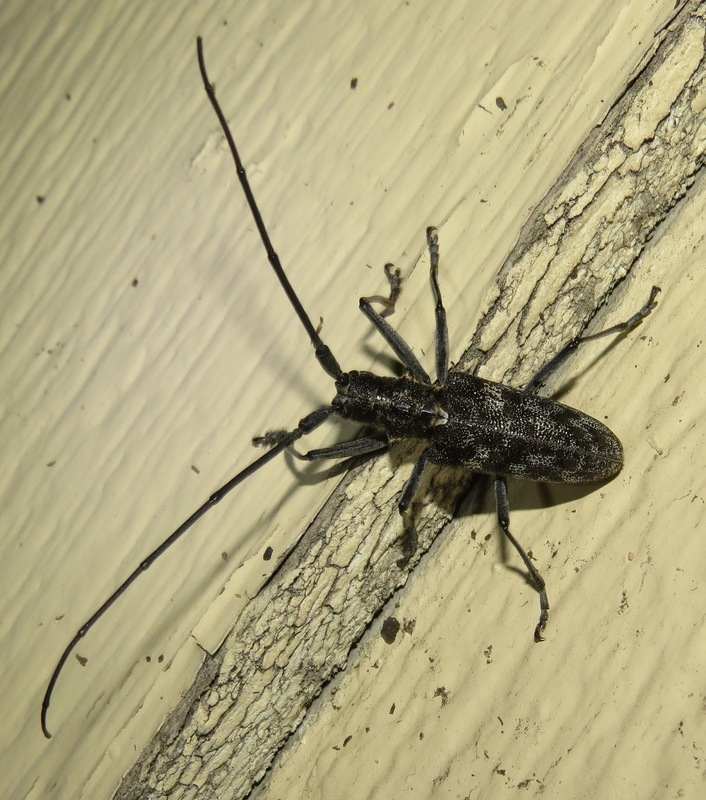 I happened to glimpse a very odd, fairly large insect out of the corner of my eye. 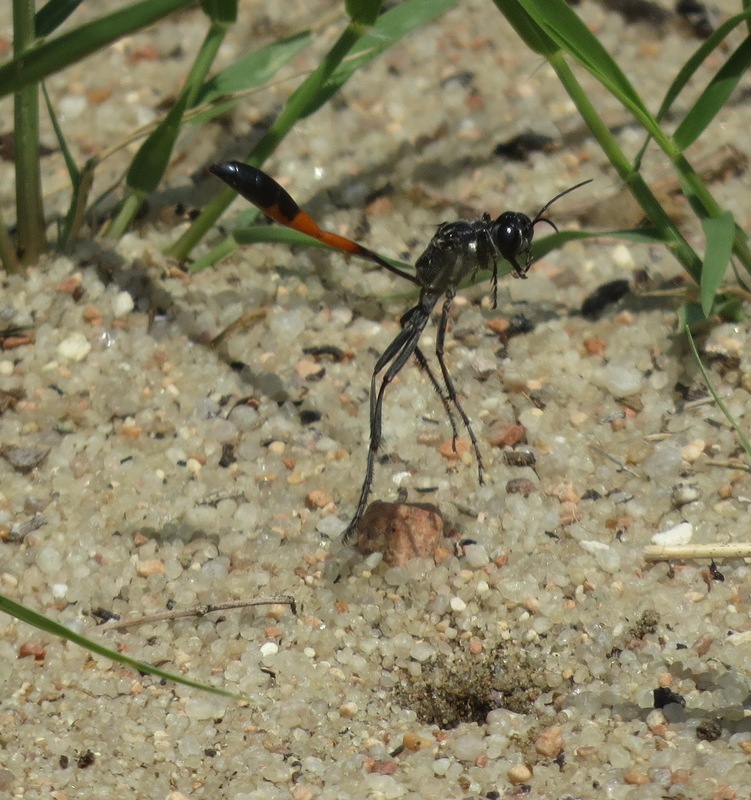 It took me a minute to realize it was not a single insect, but two: a female Ammophila sp. 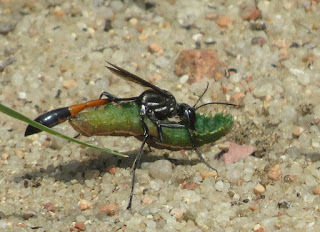 thread-waisted wasp toting a caterpillar she had paralyzed. She was trying to locate the concealed nest burrow she had excavated before going hunting, and was wandering around rather aimlessly, but at high speed. At one point she cached the caterpillar so she could orient herself without such a burden. It worked. She found her burrow, then went back and got the caterpillar. I was lucky to get any images of the transport because she moved so speedily and kept going in and out of focus. Even an attempt at video may have been almost useless. Her agility, with such a heavy load, was impressive. It would be like you or me running at full speed carrying a sofa between our legs. She abruptly dropped the caterpillar, and in a matter of seconds uncorked the stone plugging her nest burrow. 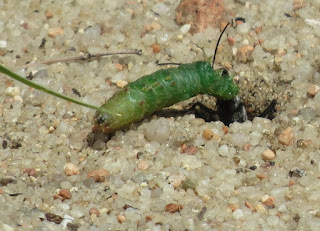 She quickly entered her burrow, turned around inside, and re-emerged to grab the caterpillar and pull it in. 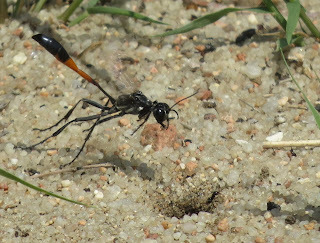 She has to be this fast to avoid tiny parasites known as "satellite flies" that will lay tiny maggots on the caterpillar before the wasp can get it secured underground. Indeed, there was at least one miltogrammine fly flitting at the entrance to the burrow. About a minute or so passed with both the wasp and her caterpillar underground. Finally, she emerged topside and quickly retrieved the stone that had plugged the burrow opening previously. She replaced the stone and began kicking sand on top of it. Notice how she curls her front "feet" to maximize the tarsal rake of spines that aid her in digging and filling. At one point she was startled by a curious ant and took to the air for a spit second. 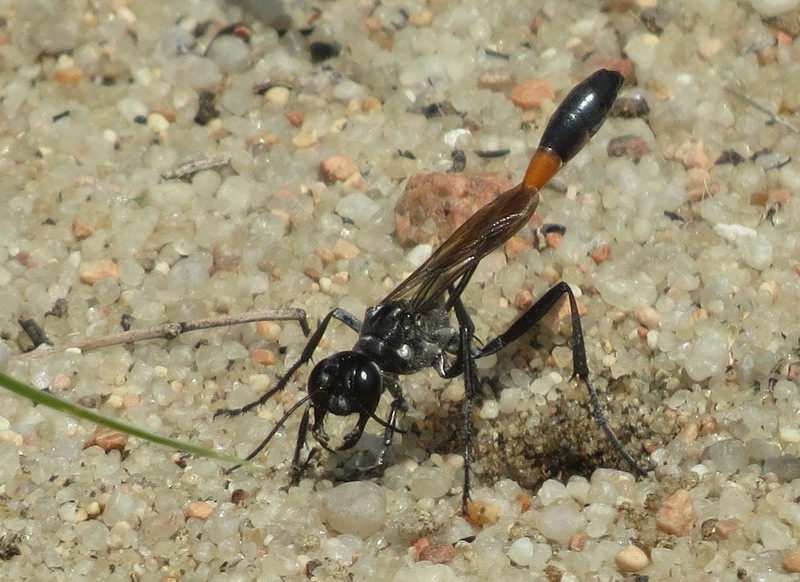 Ants can raid wasp burrows and cart off the caterpillar and wasp egg as food for their own young back at the colony. By now I was getting a bit stiff from having stood in the same place for a long while. When I left the wasp, she was apparently unsatisfied with the nest closure and was actively chewing down to the rock plug. I left her in peace to finish what she had started. 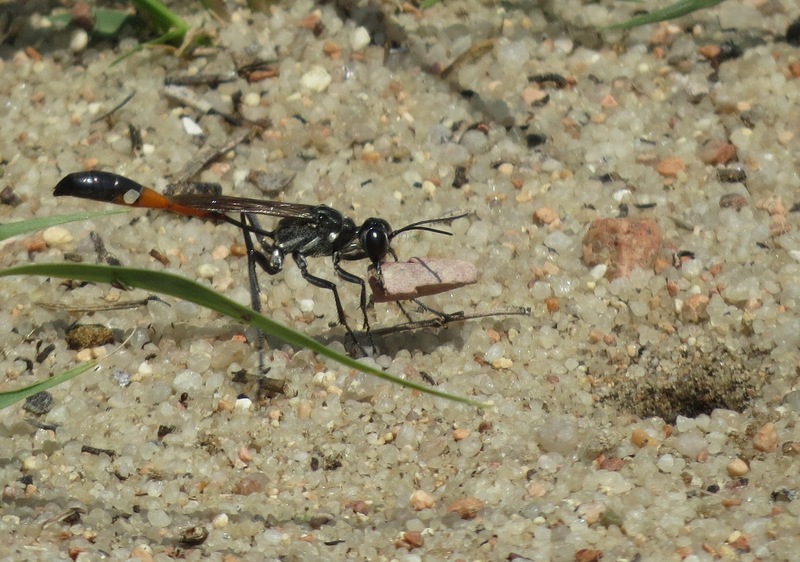 The whole sequence of events involved in the provisioning of a nest by a solitary wasp is truly remarkable. She has to dig her burrow and, load after load, flies off with armfuls of soil to fling across the landscape, lest some predator or parasite recognize her nest from piles of "tumulous" around the opening. Next, she fills in the burrow entrance, obliterating all evidence of any cavity whatsoever. She may make a brief orientation flight and then go off to hunt. How does she ever find the burrow again? We cannot even remember where we parked our car, or left our cell phone, and we reportedly have much larger brains than wasps do. Once she has completed her mission of providing one paralyzed caterpillar for a single offspring, she goes off to start the process all over again, somewhere else. 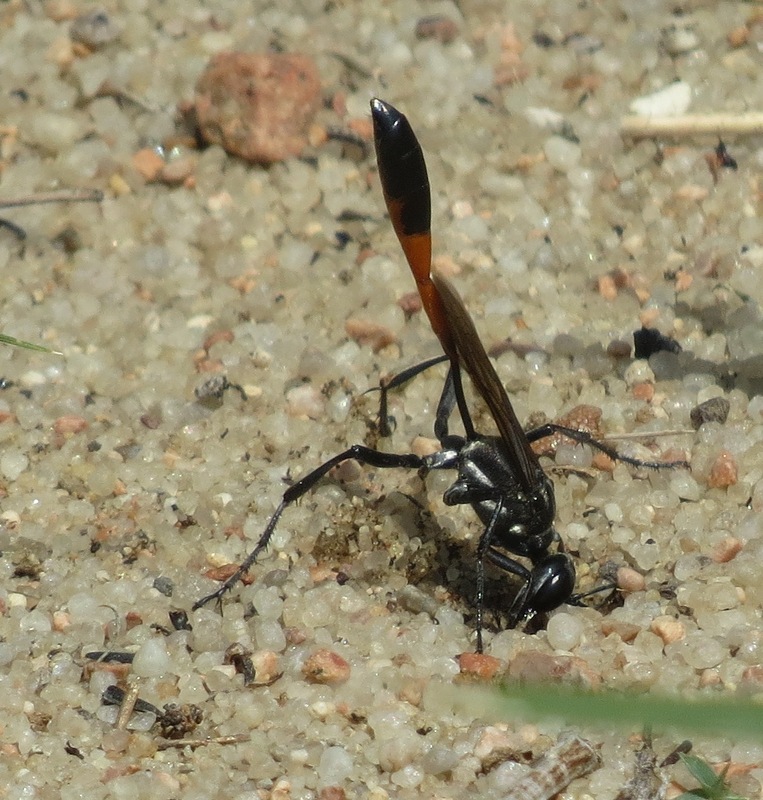 Does the wasp immediately forget about the burrow she just completed? How does that instinct work? It has to be plastic enough to address unique situations and overcome obstacles. Up and away for good? 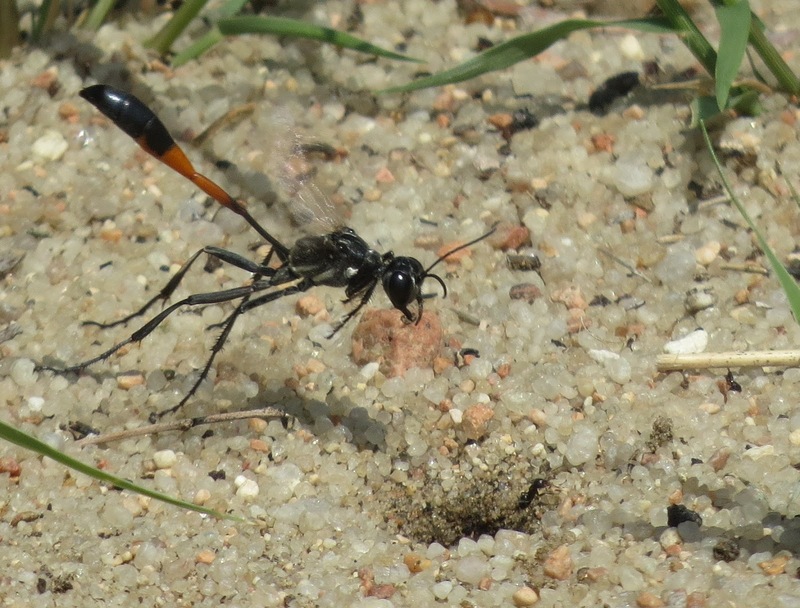 Over the coming months, in that underground cell, a wasp larva will hatch from the egg and begin consuming its still-living but inactive larder. Scientists believe that insects have no pain receptors, so that must be a blessing to the caterpillar. 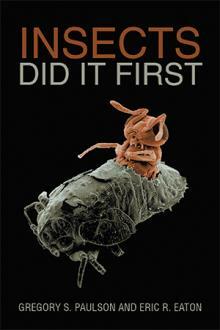 Were it deceased, though, the caterpillar would quickly rot under the assault of bacteria and fungi. 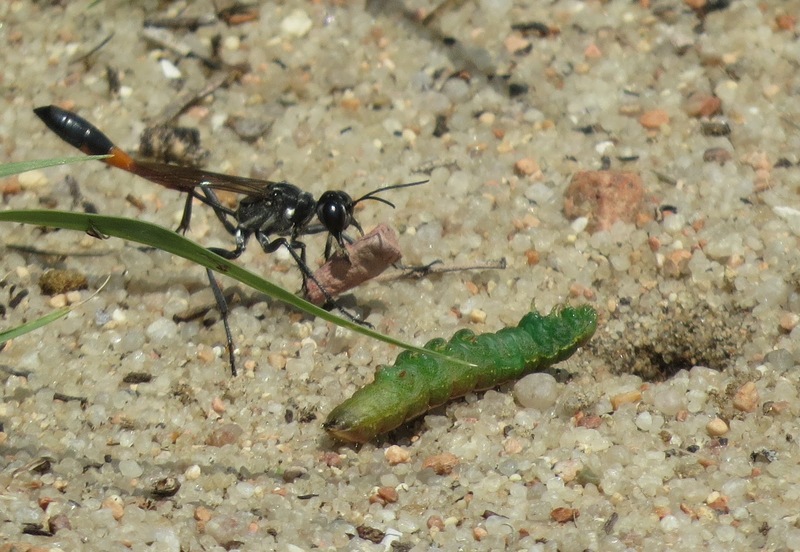 After consuming the caterpillar, the wasp larva enters the pupa stage, as equally inert as the caterpillar on the outside, but inside the pupa there is a massive reorganization of cells converting the grub-like larva in to a sleek, winged adult wasp. Some genes are turned on, others are turned off. It is amazing to contemplate that a wasp larva, or caterpillar, has inside it the latent ability to execute all the behaviors of the adult. 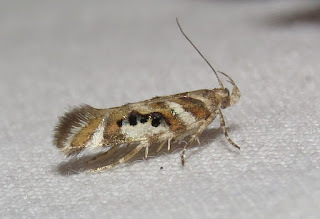 It somehow "knows" it cannot fly, does not need flower nectar, and cannot reproduce as a larva. It understands at some fundamental level that its only job is to eat and grow. The next time you are out hiking, and a wasp flies up from under your feet, stop for a second. Back up a little. Does the wasp return to the vicinity? If so, keep watching. She is probably in the process of working on a nest burrow and will resume her activities if you stand still. It takes a little practice just to think about this possibility, but the rewards can be astonishing. I have not been receiving e-mail notifications of comments on this blog as I used to, but thanks to a prompt from one of you I discovered I had a whole backlog of comments awaiting my moderation. Some of those dated back to September of last year! I will try and get the notifications generated again, but in the meantime I will look in on pending comments at least weekly. You have my sincerest apologies for this oversight. Thank you. Why do I bother screening comments? My posts would be "spam city" if I did not, and I know you don't want unsolicited advertisements for Viagra and such, abusive language, and other nonsense. Here in Colorado Springs, Colorado, and elsewhere in the state, it has been anything but a normal summer. Not that there is any such thing as "usual" in this age of aridification and climate change, of course. What follows are personal, anecdotal observations related to weather, insect diversity, and insect abundance so far this season. There are only three words needed to describe the weather this summer: Hot, dry, and stormy. We have had recent stretches of ninety-plus degree days, well above the expected average. 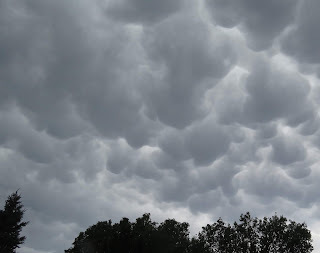 The excessive heat has been punctuated by severe thunderstorms. 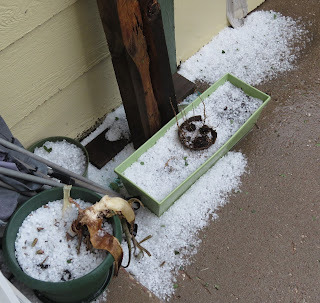 At our home, we have had more hail events this year than in the five-plus previous years that I have lived here....and we were lucky. One major hail storm dumped baseball-sized ice balls on the city of Fountain, just a few miles down the highway from Colorado Springs. Repairs to vehicles and roofs and other damaged property will take months and cost many thousands of dollars. Accumulated hail in our backyard today! Beyond the city, at least fifteen wildfires have burned thousands of acres of forest and grassland, rendering wildlife habitat and recreational destinations unfit for man or beast for years to come. That does not even address the human dwellings and other structures that were lost in the blazes. Now, heavy rains like we had at our home today will cause flash flooding over the burn scars, and lead to water damage at the bottom of slopes. 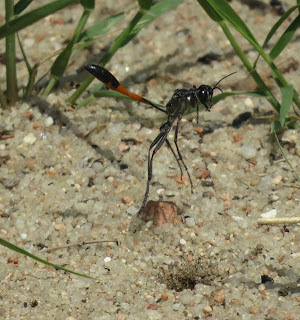 Insect diversity appears....relatively stable, though it is difficult to assess for reasons that will become clear later in this story. Interestingly, every time I turn on our backyard blacklight I seem to attract some species new to me and new to our growing "home list" of animal organisms that now exceeds 440 taxa (levels of classification from Kingdom to species and every level in between). I have managed to excite even seasoned moth experts with some of the nocturnal Lepidoptera that are turning up. 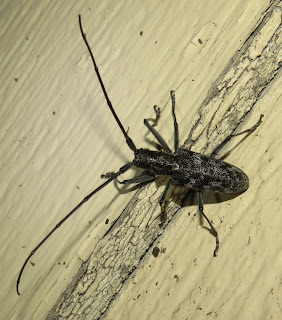 We have even had a pine sawyer (Monochamus clamator) and bark beetles (Dendroctonus sp.) come to the blacklight. I suspect someone brought firewood down out of the mountains and the beetles are emerging from it. Numbers of individual insects are way down. I have to work hard just to find species normally overwhelmingly present. It is this situation that has made assessing diversity more difficult. It is disturbing to note how few insects there are visiting wildflowers, but wildflowers are fewer and farther in between, too, smaller in size and lower-growing than usual, making it difficult to detect them, let alone any pollinators. Yellow Sweet Clover, Melilotus officinalis, an exotic invasive that is now well-established throughout the U.S., and its relative White Sweet Clover, are overwhelmingly abundant this year. They normally attract plenty of pollinators, but I find almost none. Another worrisome observation is that the few arthropods doing well are mostly parasites of other arthropods. 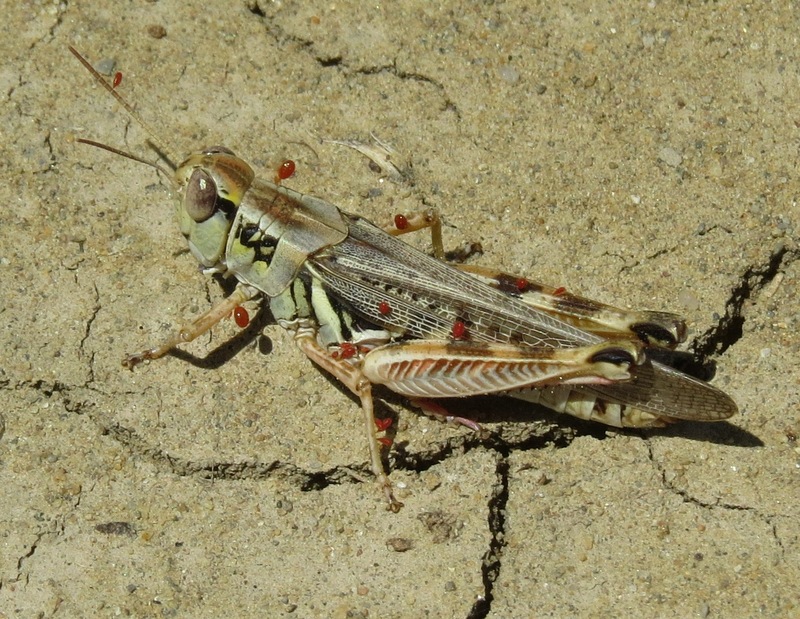 Parasitic mite loads on grasshoppers are in some instances frighteningly high. 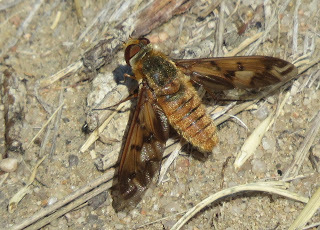 Bee flies are doing well but their hosts, solitary wasps and bees among others, are not prospering. Cuckoo wasps and cuckoo bees are at about average density and distribution. Even the European Paper Wasps nesting on our back gate have failed to produce more than about two new workers the entire summer so far. That is shocking since they are among the most successful of social predatory wasps. Should this year be the beginning of a trend, it would be devastating. Our drought-stricken landscape needs to be watered with historically normal rain patterns or another Dust Bowl will be upon us, threatening not only wildlife diversity but human sustenance in the form of crops and livestock. The forest wilderness cannot take further fragmentation if wildlife populations are to endure, especially large predators that require vast individual territories for hunting and rearing offspring. We need to start treating our own properties as potential wildlife habitat, planting with native vegetation. 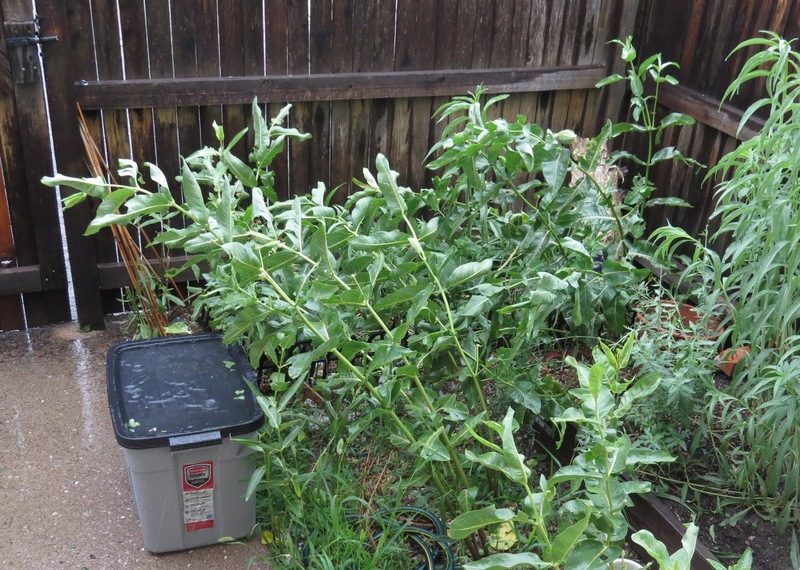 It may be that we also need to assume some degree of latitudinal climate change and plan accordingly, adopting drought-resistant cultivars into our landscaping. What are you observing where you live? Share your stories and concerns and possible solutions. This blog is a community built by all of you, please speak up. 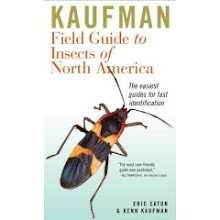 The insect world is full of drama, one of the major attractions for entomologists and naturalists and wildlife photographers. 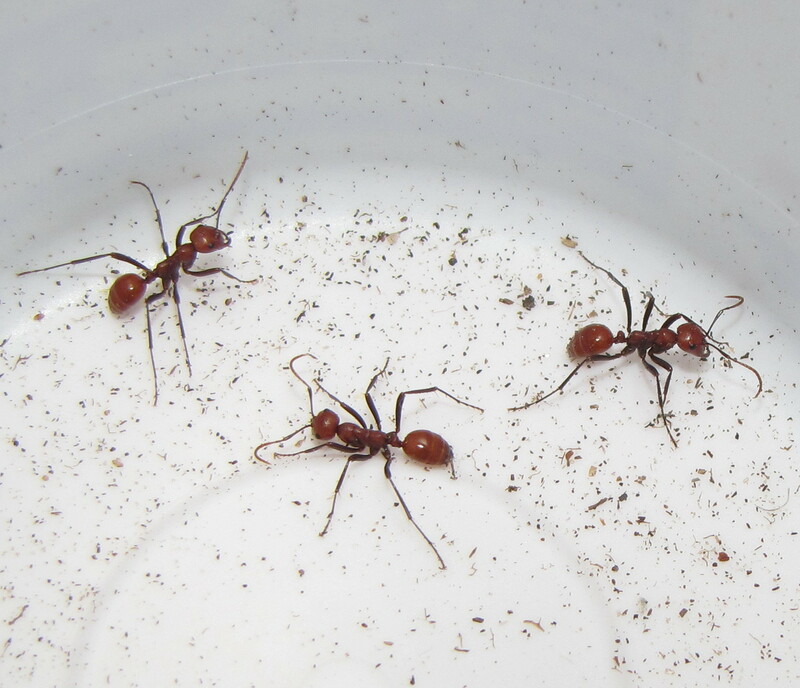 Among the more rarely-witnessed phenomena are raids by slave-making ants in the genus Polyergus, known as "Amazon ants." I have had the privilege of seeing three separate slave raids while living here in Colorado Springs, Colorado. All have taken place in late afternoon or early evening. The latest was on July 1 of this year when my wife and I were hiking a trail in Cheyenne Mountain State Park. 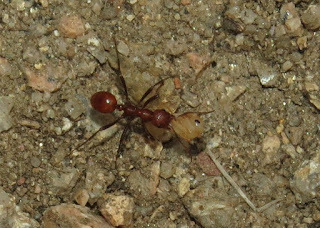 She happened to pause at what I initially dismissed as yet another harvester ant trail, worker ants bustling about with grass seeds. Amazon ant workers carrying pupae of their "slaves"
The ants were actually carrying the pupae of their host, ants in the genus Formica. We traced their apparent destination to a Formica colony, but I have learned that this makes sense. The adult slaves on the receiving end of this raid represent members of a colony taken over by an Amazon queen that managed to dupe the workers of an existing Formica colony before killing its queen. Those workers will now set about rearing these most recent arrivals, "adopted" larvae and pupae. The anatomy of Amazon ant females is such that they are obligatory warriors. Their bodies are sleek and shiny, their slick exoskeletons deflecting the attempted bites of their victims. The jaws of Amazon ants are sickle-shaped and designed to do only one thing well: pierce the heads of the worker Formica ants. Amazons cannot feed themselves, let alone excavate a nest, so they must depend on existing subterranean nests of their Formica hosts. 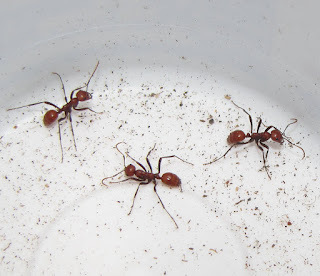 The Formica workers at the receiving end of the Polyergus raid were already enslaved! The efficiency of a Polyergus slave raid is stunning. One wonders if the victimized colony, pilfered of most of its juvenile workers, ever recovers from such devastation. These ant pirates show now mercy, except for the kidnapped larval and pupa offspring, the majority of which they somehow manage to transport without injury. Not that some of these soft-bodied juveniles will not end up as food instead of slaves, mind you. 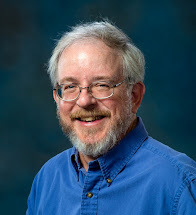 How this specialized lifestyle came to be is open to conjecture, though a reasonable theory comes from studies of ant evolution and genetic relationships. There are slave-making species in the genus Formica, some of them obligatory slave-makers, and others facultative. Facultative social parasites are species capable of existing and prospering in the conventional sense, but are also opportunistic slave-makers. 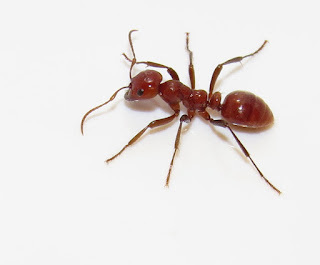 It is surmised that Polyergus Amazon ants evolved from the obligatory slave-making Formica species. Indeed, they appear closely related. 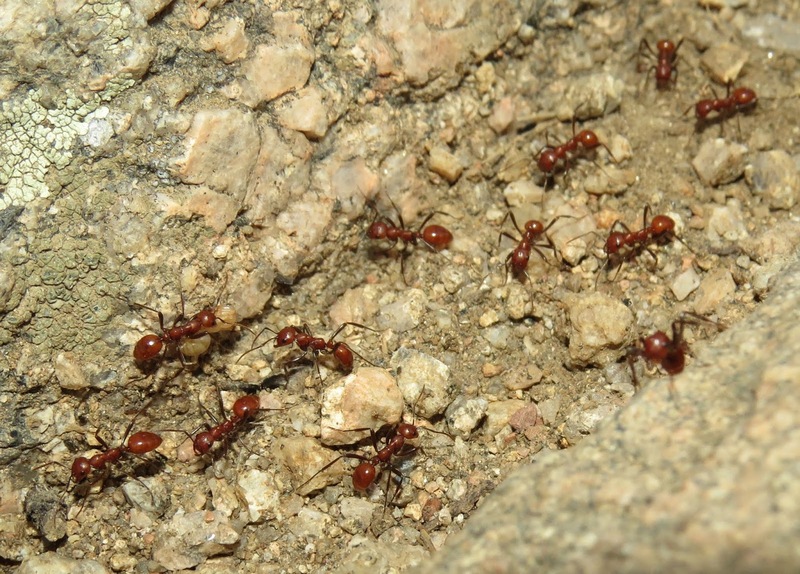 An average colony of Polyergus is between 300-500 workers, surrounded by many hundreds of their slaves. 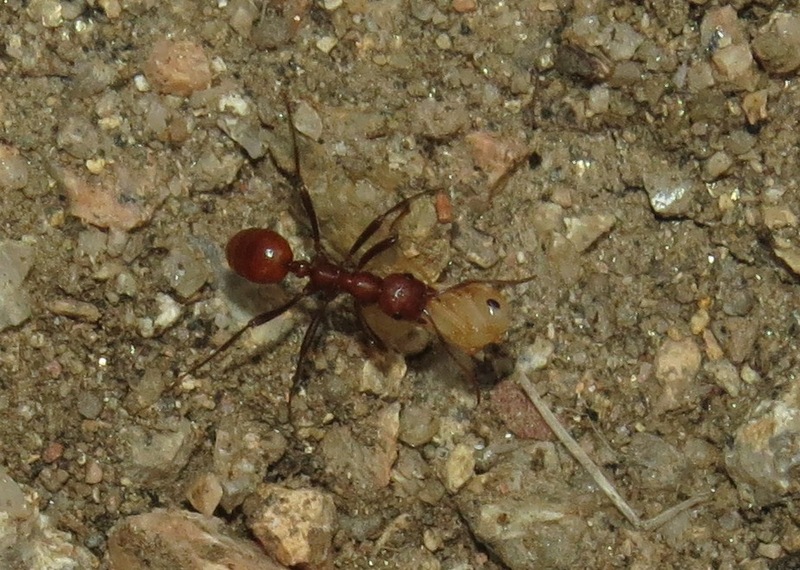 Such a colony can include a mix of different Formica species. 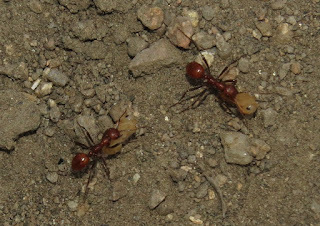 Raids on Formica colonies are frequent, and so Amazons need a robust population of host colonies that they can draw from. The genus Polyergus is holarctic (found throughout the northern hemisphere), but reaches its zenith of diversity in the United States. There are fourteen species in the world, eleven of which are found only in the U.S. Polyergus mexicanus is likely the one I have been seeing here along the Front Range of the Rockies. 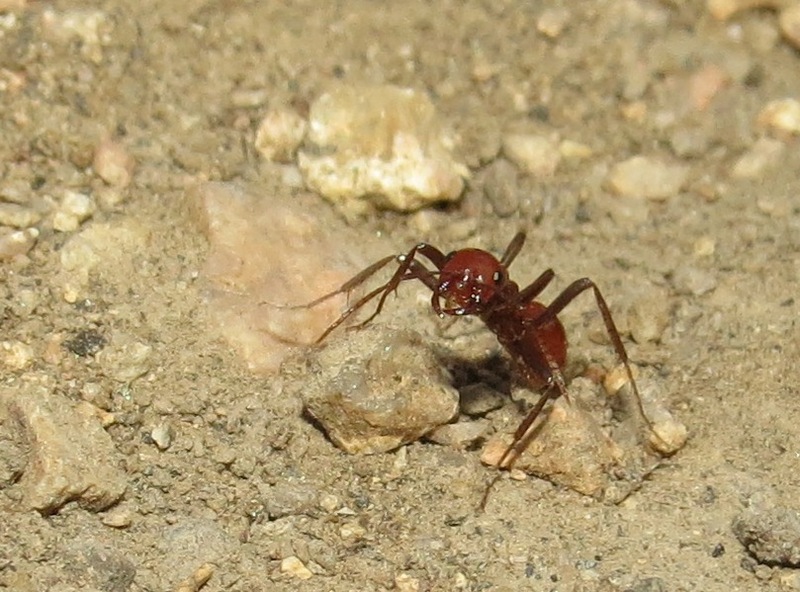 Ant diversity in general is surprisingly great here in Colorado, so it is easy to assume you are only seeing a few species when in fact there are several. 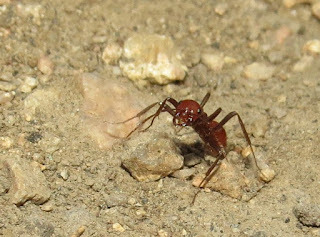 Keep an eye out for interesting ant behaviors, and try and document them as best as you can. 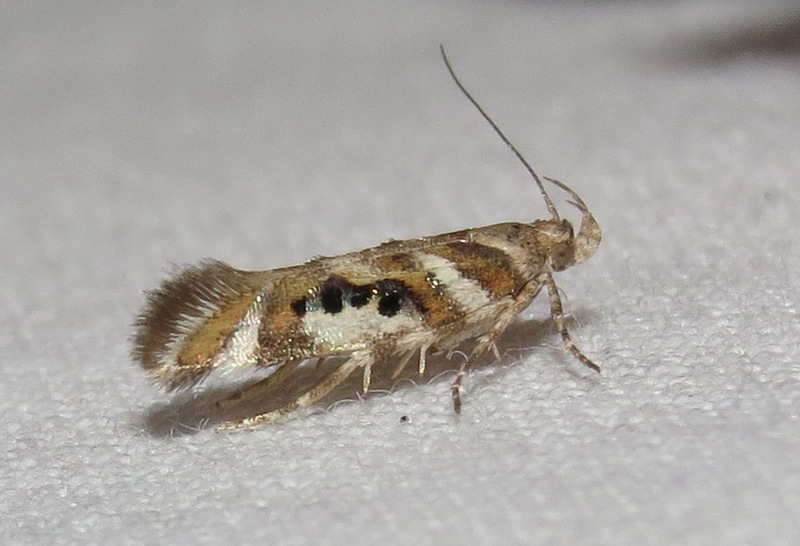 You could shed new light on our collective knowledge of these amazing social insects. Holldobler, Bert and E.O. Wilson. 1990. The Ants. Cambridge, Massachusetts: The Belknap Press of Harvard University Press.732 pp.